Can you see it? Here's the close-up. It's actually a pipe connected to our basement sump pump which pumps the water out to the street. It's ugly. And white. Which is not a nice contrast with dark brick. Of course I didn't want to spray the surrounding brick so I rigged up a shield with an old box which was headed for the recycling anyway. I also taped off around where the pipe goes into the house so the brick there wouldn't get too much over spray. Sorry, I forgot to photograph that part. And apologies for the darkness of these pictures. I did this at about 8 p.m. last night when the temperature finally dipped below 90 as recommended on the paint can. So much better and I won't think about how ugly it is every time I pull into the driveway. We have a few other pipes for our downspouts in back which I may give the same treatment so they blend in a bit more. 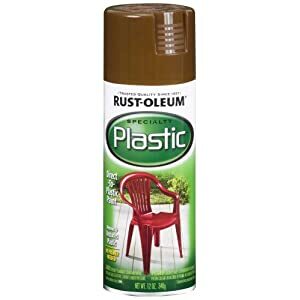 Unfortunately the plastic paint doesn't come in tons of colors so it's harder to find a good match to the dark green-brown siding. Brown/espresso may be the best option because it at least blends with our brick foundation (which goes all the way around) and mulch. Did you do any quick fix projects this weekend?